Homepage Mobile Phones Apple iPhone iPhone 4G Heading For Verizon? Okay, right off the bat I’ll say you will need to take this one with an extremely large dose of salt, but apparently recent marketing materials for the Big Red seem to indicate that an iPhone 4G is on its way to the United States largest carrier, or it could be that someone has simply made a typing error on the packaging. Like the article says, this is probably the work of some overzealous employee who is so used to typing 4G made the mistake and thus associated the iPhone as either being a 4G enabled smartphone, which of course it isn’t, or an iPhone 4G. 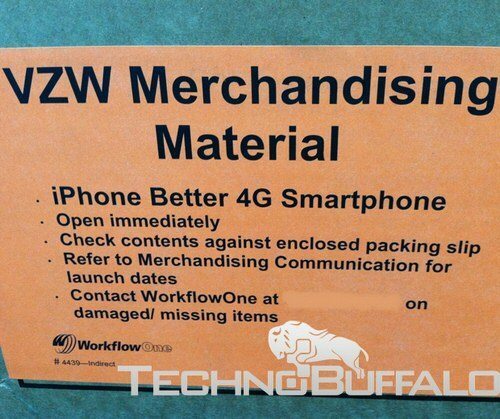 Have to say that is probably the case with this package, so you shouldn’t read too much into it, on the other hand it could possibly not be a mistake or typo and Verizon could be shipping out marketing materials for an iPhone 4G, perhaps they know something we don’t? On the other side of the coin, one could look on it as the Big Red is pushing out marketing materials ahead of the iPhone 5 release and is privy to the knowledge that the iPhone 5 will be able to play nice on their 4G LTE network, especially as the word is Verizon is rumoured to be discounting iPhone 4 accessories in the assumption the iPhone 5 will release soon. There was also a rumour some time ago that Apple would deliver an iPhone 5 4G smartphone to China Mobile, while other rumours have said the next generation isn’t likely to support 4G, while over numerous months there have been many rumours concerning the iPhone 4G. And that’s about your lot on this little piece of speculation, so what do you think, is this purely the work of some inept employee making a simple mistake, or does Verizon have the inside scoop that the iPhone will soon be 4G enabled? Feel free to voice your opinions to our comments area below.